Our hotel is centrally located in the north of Noord-Holland. That makes us a perfect base for day-trips to museums, the island of Texel, Alkmaar, the IJsselmeer dam, Den Helder, Hoorn and the Noord-Holland coast. Within 20 car minutes you will have reached the Noord-Holland coast. Here you will not find overcrowded beaches, hip beach pavillions and long traffic-jams. The beaches within the north of Noord-Holland are still regular family beaches. 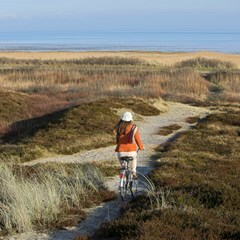 The scenery in the north of Noord-Holland can best be explored by bike. Cycle along the dunes, the flat Wieringermeer landscape or the former island of Wieringen. The choice is all yours. Bobbing crocodiles, hundreds of colourful birds, playful ring-tailed lemurs and monkeys on the hill and... are those fallow deer in the forest? You'll find it all on Hoenderdaell Estate!